Figure 2. “POD” by Chris Cox Wild_Canary installed in Providence, RI, since May 2016. 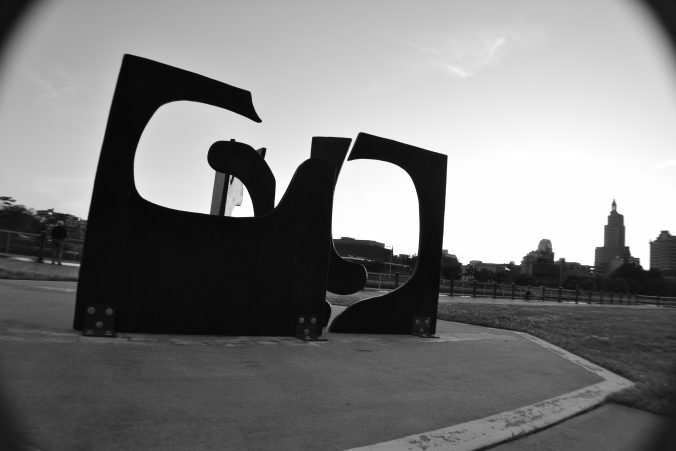 The artists premier sanction public large scale sculpture the sculpture stands 7′ tall and 12′ in diameter the cluster of six black, fiberglass, monolithic, abstractly shaped panels reveal whales within the negative space created by their silhouettes when considered in pairs. Figure 3. 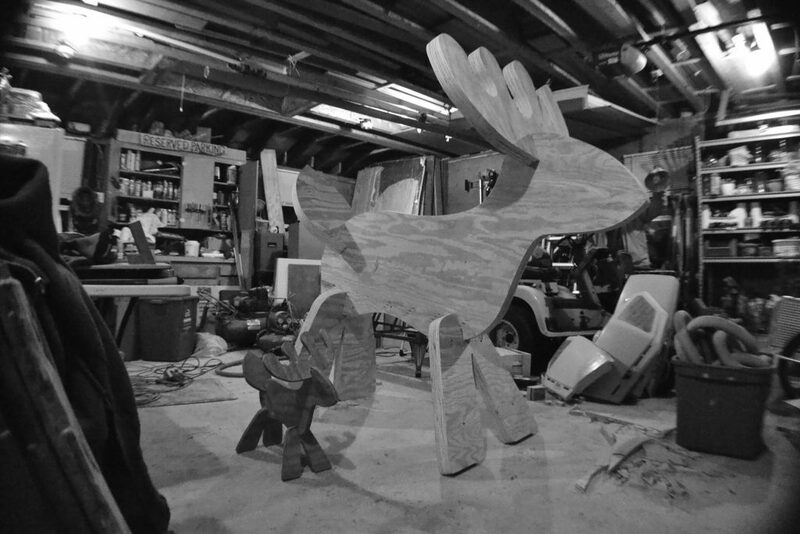 The sculptural design “Reindeer” being seen mid-fabrication to a scale of 3 based on the original maquette [seen next to its larger cousin]. This monumental abstraction of a wooden children’s Christmas toy stood 5’6″ tall 2′ wide and 6′ long and was installed in The Arcade in Providence, RI, for the 2017/2018 holiday season. Figure 4. “The Windy Origin Edition AP” seen from behind. 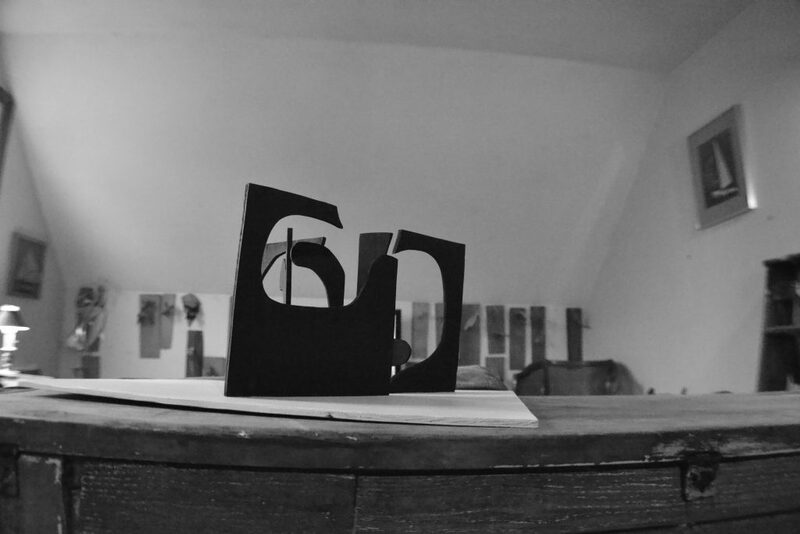 A minimal abstraction of a dog, this sculptural design is in the proccess of being fabricated 11′ tall, 12′ wide, and 17′ long, for temporary exhibit in the Rlying Horse Outdoor Sculpture Exhibition in South Hamilton, MA, August – November 2018. Seen in the wooden scale 1 Origin Edition format three angular hook shaped beams make up the legs and tail of the dog, while the dogs head is a curvy boomerang shaped panel, filled with holes of varying size that make the canine’s piercing gaze and give interest to the ears. Not only does the stance of this abstract depiction of my dog create a sense of motion, the sculpture itself can move as it is held together with an unbonded steel pin system, allowing for interaction and play with the piece by being able to swing the dogs tail and the legs in relation to one another, making the dog come alive with its ability to assume different stances. Figure 5. “The River Crab Origin Edition AP,” defined by sharp, edgy, contemporary lines. 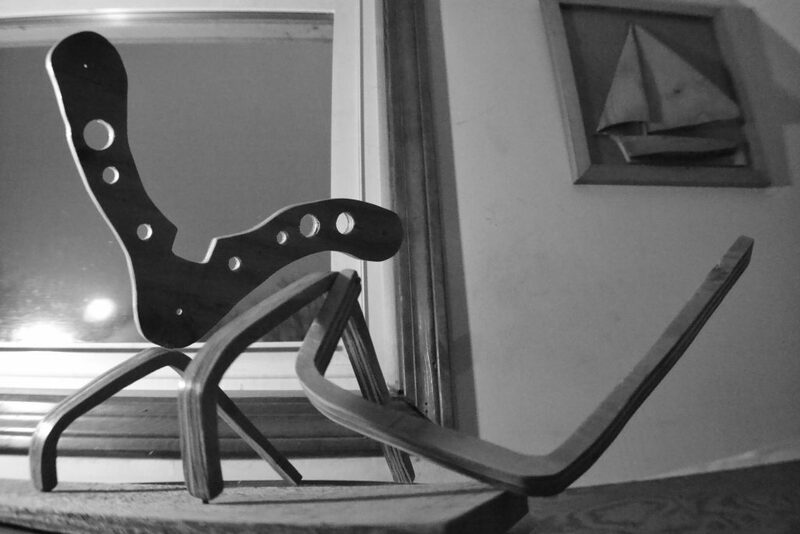 A futuristic abstraction of a crab, this sculpture is of engineered interest, modular in design four wooden leg components contact the ground at their extremities and meet in the center at a carbon fiber junction plate which levitates above the ground plane, due to its connection to the legs by way of a steel pin system. Above this black junction plate seemingly floats a iridescently white, fiberglass plane that curves through axis, making the head of the crab. Figure 6. “The POD Origin Edition AP” seen in the artists home with numerous other maquettes hanging on the wall behind it. The design created in this wooden format 12 times smaller than it stands in Providence, RI. 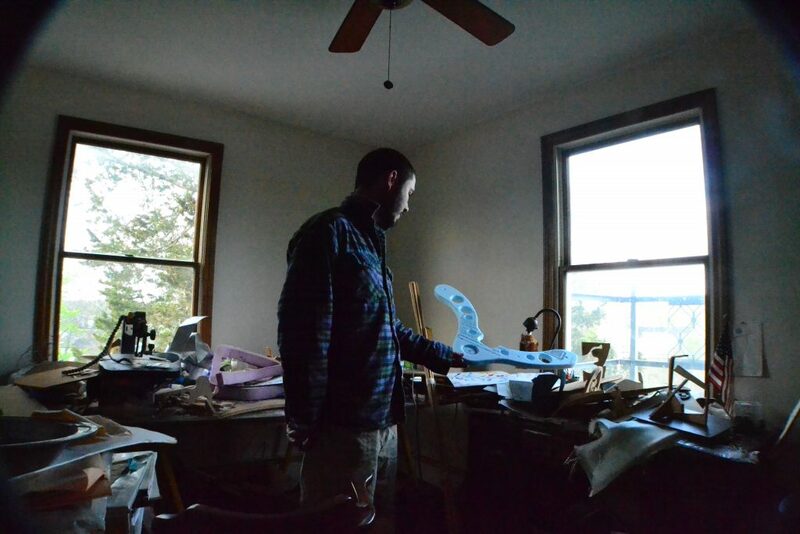 Having dropped out of the local community college in the first weeks of an artistic education due to mental illness, Chris Cox is artistically self-taught but trained in fabrication processes. Within the artist’s aesthetic, representative abstractions are visual metaphors of rules and lessons of life learned through the survival of schizophrenia. In Wild_Canary’s sculptural practice, all his designs start off as small maquettes, most commonly made of wood and fiberglass. Once a design has been created, he makes careful plans to recreate it on different scales. The artist viewing all the maquettes as future large-scale creations. 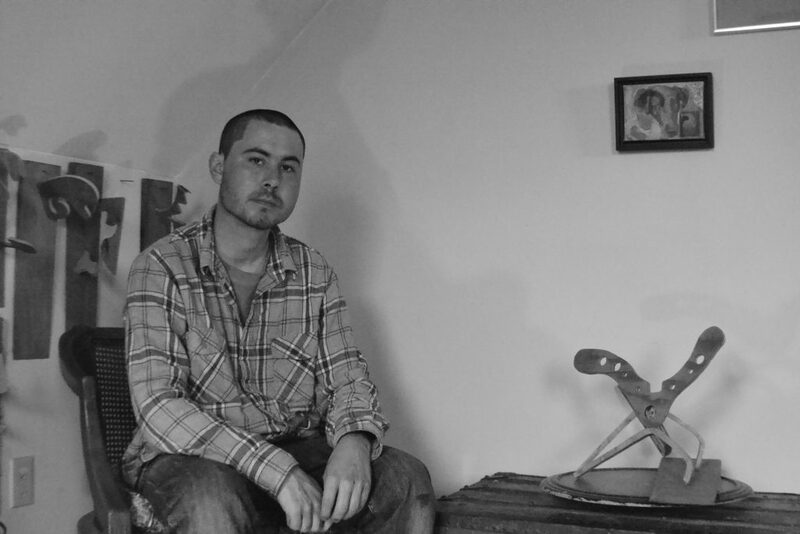 Using the skills and experience gained through employment as a boat builder and custom fabricator, the artist is able to consider the large-scale fabrication of the design as he is creating its concept, preemptively solving problems. Considering the transportation and installation of the large scale artworks, Cox favors composite fabrication, thanks to its light weight and strength.